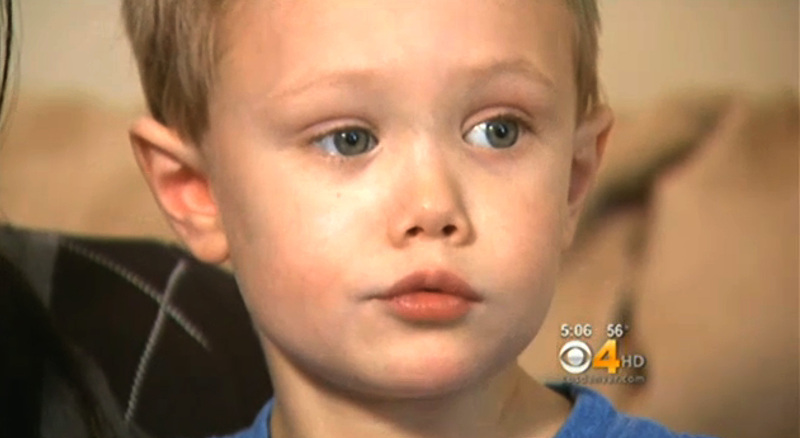 A four-year-old boy from Colorado survived a three-story fall, miraculously landing on his feet. Dylan Hayes fell out the window of his Aurora apartment while his mother was shampooing her carpets, CBS Denver affiliate KCNC reports. She had moved her couch to the wall when Dylan climbed on it to talk through the windows to the downstairs neighbors. "I fall ... really, really far," Dylan told CBS reporter Evrod Cassimy. His mother, Jessica Hayes, said she hopes the scary event serves as a warning for parents with young children. "I was terrified," Jessica said. "I didn't know what I was going to see when I got down to the ground floor." Dylan fell out of the third story window, did two somersaults in the air, and landed on the rock below on his feet. The screen he broke through suffered more damage than he did, KCNC reports. The boy was hospitalized for 20 hours, wearing a neck brace as a precaution. But he was released with barely a scratch. "it's gotten easier since it happened two weeks ago to not blame myself," Jessica told the station. "I wish the danger would have crossed by mind, which it didn't." Jessica told KCNC she has since moved out of her apartment to live with a relative, and is looking for a new home -- on the first floor.